Winner Winner Chicken Dinner! | OccasionalPiece--Quilt! 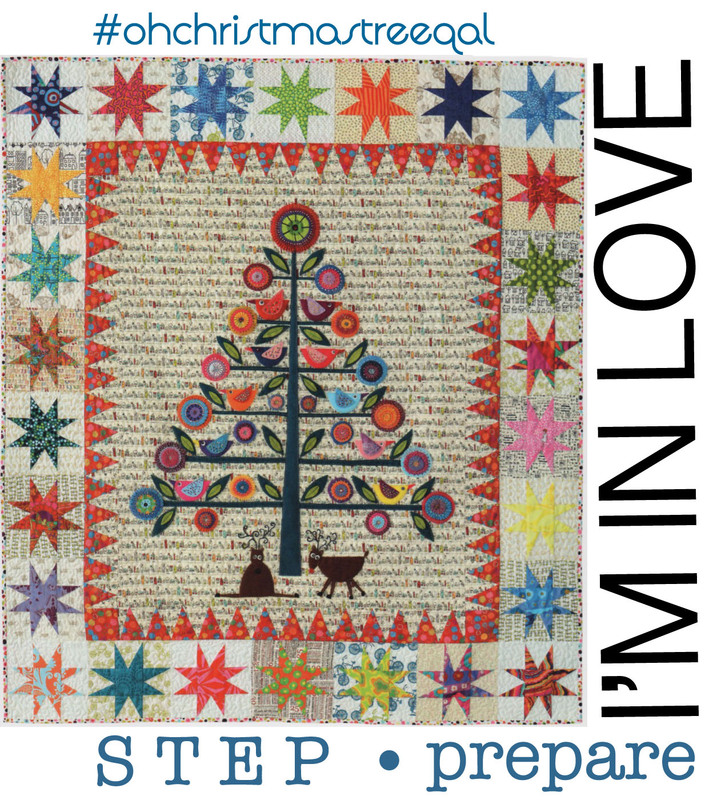 ← Oh Christmas Tree Quilt-A-Long & a Giveaway! Posted on January 8, 2016 by Elizabeth E.
The winner of our giveaway is Quilter in Motion, aka Marsha. And no, she doesn’t get a chicken dinner–I just like saying that. Thank you so much for all your birthday memories–I loved reading them! I have a couple of favorites, and have read many of them to my husband, who also picked a few of his favs. You are all the best. You’ve all been busy out there in Quilterland, contacting felted wool/wool felt suppliers and I have a few more pieces of information for you, as you collect and gather. Stephen had shopped around at some other sites and found this one to be most reasonable. Erin has those bundles up there, ready to go, if you want one too. This screenshot is Primitive Gatherings’ offering. 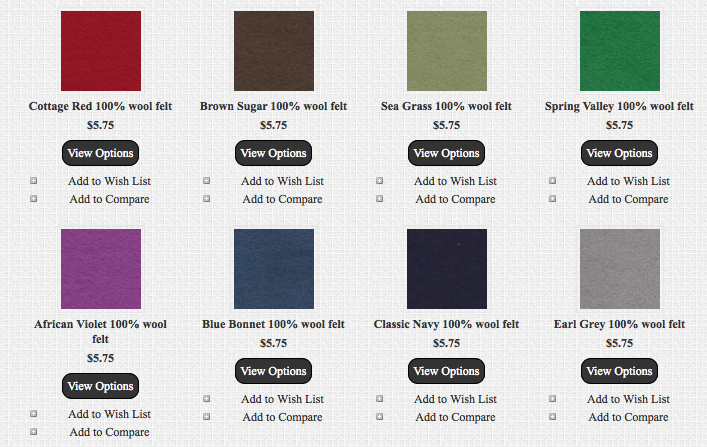 I was down in there shop this past week, and they stock felted wools, but no wool felt. They are beautiful, though. You can purchase them on their website, too. 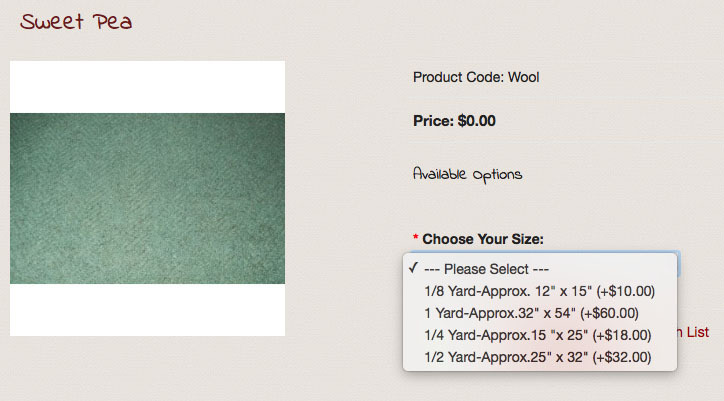 Whether or not you’ve already purchased your wool, you can bet that halfway through the project, you’ll be wanting a different color, so either head over there now, or save this for later. I so appreciate those who have written in to pass on information for others to benefit from. The next post on this will be in a couple of weeks, just after the beginning of the February. 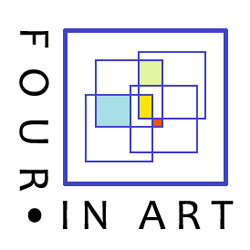 On February 1st, we have the reveals for our art quilt group, Four-in-Art, a collaborative group of quilters who wanted to try something different. We post four times a year (hence the name) and work in the chosen themes. This year’s theme is Color, and February’s challenge is Microscopic. Before that, I’ll be going to Road to California, where I’ll have two quilts hanging in the show–if you are going, please DM me on IG and find me–I’ll be the girl with the goofy smile standing in front of one of these quilts. I generally post a lot on flood Instagram with quilt photos from the show, so you can find me there: occasionalpiecequilt (the button is on the right, if that’s easier). Okay, Marsha, I’ll be in touch with you to get your snail mail address and get your magazine off to you! I’m really looking forward to seeing all these Christmas Tree quilts develop! Congrats to Marsha. Hope to see you at Road if the doc releases me to public events. Thank you so much, Elizabeth. I’m excited to get the magazine and have that great pattern. You can be sure I’ll be working on it when I get the okay to ‘do something’. I have mixed wool felt and felted wool in projects and they work great together. I prefer felted wools myself. Thank you again. I’ll be honest, I am not sure of the difference between wool felt and felted wool (yes, I thought they were the same!!) but it is interesting to watch and learn! How fun to have TWO quilts in the Road to California show! Maybe there will be another magazine feature too! Congrats to Marsha! Elizabeth your show quilts are beautiful!